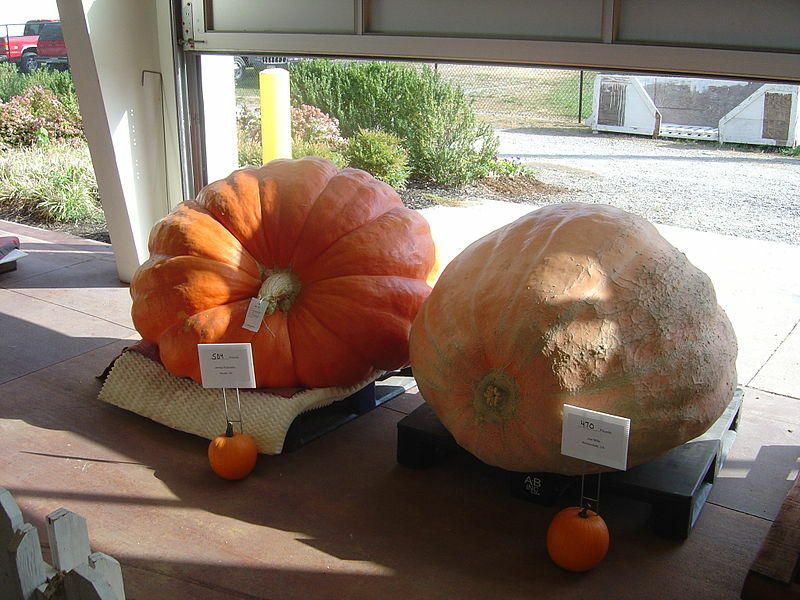 Large pumpkins grown for competition (left 504 lbs, right 470 lbs), compared to normal size pumpkins in the foreground. Okay, so it seems that we’ve got a few technical issues to solve before we can safely grow vegetables up in the air, but let’s return to our thoughts and discussion about the potential and future of vertical farming. In Part 1 we asked the simple question, “Could WSU Feed the City of Pullman?” and immediately immersed ourselves in the technical and science fiction wizardry of farming in skyscraper size greenhouses. Before one critiques a concept, it’s always good to go to the original source and gather your raw facts and information for careful analysis. And that’s just what I did when I downloaded a copy of Dr. Dixon Despommier’s book, “The Vertical Farm – Feeding the World in the 21st Century,” and read it on my iPad while flying across the country on a recent trip. But before I begin, I’ll tell you what I’m going to do. You’re undoubtedly busy and don’t have much time for a book review and delving into the technical details of architectural design, energy and water use, horticultural production, etc. So I’ll begin with a “CliffsNotes” version of my analysis and bottom line conclusions, and then at the end, provide some additional information links for those who want to follow up with their own study, which I always highly recommend. Those who read Dr. Despommier’s book on vertical farming will be disappointed if they are expecting an engineering or architectural treatise and a detailed how-to blueprint for vertical farming. That it is not. Instead, the book does precisely what it says it will do – justify and explain the rationale and concept of the future of urban food production in high technology, high rise greenhouses. And on that score, it does just fine. Some people might not be enthusiastic about starting the book and then quickly being taken on a whirl wind tour of the evolution of agriculture. But it didn’t bother me, because the book is well written, interesting, and a quick read. And after all, how bad can a little history be when you talk about Neanderthals? As Despommier notes, “Fifteen thousand years ago, there was not a single farm on the planet.” My, my, but we’ve come a long way, baby, considering that farming and agricultural production now consumes a land area about the size of South America and uses about 70% of the world’s fresh water, according to Despommier. But what’s even more scary is where we’ll be in just a few short decades with a human population projected to likely hit 9+ billion people in the next 50 or so years. If we’re already using that much land, water, chemicals, and energy just to feed the insatiable bellies of our cities, consider the requirements for ramping up food production to feed another 2-3 billion more people on top of that. Despommier claims we’ll need to add another farmed land area the size of Brazil if we stick with current farming technology. This rather scary projection, combined with the already huge impacts of farming on the natural world, is the basis for Despommier to argue that we need an additional and less environmentally destructive way to meet future food demands. Not much to argue with there. If you completed my suggested homework assignment from last time and took a peek at the additional readings, you saw that the web site for the Vertical Farm Project has a long list of the potential advantages offered by farming in high rise greenhouses. I won’t repeat those here, but even without study, people may suspect that larger (taller) greenhouses, conceptually, might offer advantages for producing larger, more consistent volumes of food with potential efficiencies in climate and pest control and use of chemicals, water, and space. However, in terms of the cons of high-rise food production, even greenhouse neophytes like me will wonder about the actual requirements for lighting, heating, cooling, and also water use thrown in for good measure. These are certainly the major operational considerations, along with the ever nagging economic factors that need to be considered for the concept to be viable. So let’s run through the major criticisms of the vertical farming concept. If you attempt to track down technical facts and analyses on vertical farming in the scientific literature, as I did, you quickly run into a brick wall. Peer-reviewed technical analysis of vertical farming apparently doesn’t exist yet, or at least doesn’t seem to me to be abundant or readily identifiable in routine literature searches – despite a wealth of information on more “ordinary” greenhouse plant production. Consequently, some of the informal critiques of vertical farming appear in non-peer reviewed sources, such as the Energy Farms web site. For the curious reader, however, the preceding web link provides an example of applying a systems thinking approach to calculate actual costs and benefits and relative efficiencies of trying to provide energy and water for food production in large greenhouses. The bottom line here is that if you put a lot of energy into producing lettuce (or other crops) using artificial lighting and current energy sources, the payback is pretty bad. Actually, it’s negative. Energy inputs for lighting, heating, and cooling can vastly exceed the amount of energy produced in foods, depending on the source of energy used. It often is far cheaper just to produce the food out on the landscape the old fashioned way – by putting seeds in the ground and letting Mother Nature do her work. However, before we simply write off vertical farming as a pie in the sky concept (sorry, I couldn’t resist! ), I believe the concept needs to be rigorously evaluated in more than a generic, one size fits all fashion. The reason behind my assertion is that the relative costs and benefits of any high rise, high technology greenhouse will be strongly dependent on the specific design of the building, the technology that is used or invented, the energy and material inputs and outputs, and the entire ecological system that is assembled. Consequently, different greenhouse locations around the world, and different approaches to ecological and engineering designs, coupled to different approaches to energy and resource use, may provide entirely different perspectives on the feasibility for vertical farming. And there are other potential negative factors not yet mentioned much in the popular literature, such as increased bird kills on tall glass buildings glowing in the night. Therefore, I’m going to do something that may surprise you by throwing my hat in the ring with Dr. Despommier (at least partially) and say that the vertical farming concept has some as yet undetermined potential and at least needs to be fairly evaluated by scientists and engineers before we discard the concept. And I’ve got some ideas and conclusions about vertical farming relative to our agricultural and engineering mission at Washington State University, and perhaps even a new invention or concept or two of my own to throw into the discussions. I will present these ideas in the upcoming, Part 3, of this series and hope to see you there. But maybe to start getting used to a future that may include vertical farming, when you walk under the trees on campus or in the arboretum this week, be careful, look up – and duck! 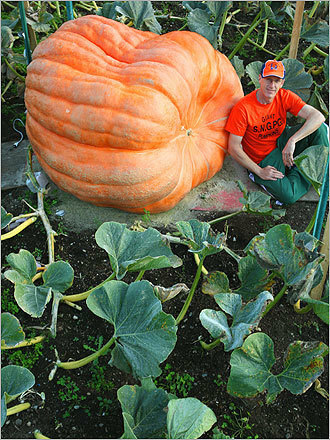 Are you sure that’s just an acorn and not a pumpkin growing up in that tree?